Yoohoo~everybody~! I'm posting something in a million years! This blog is still alive~yeah! It's a very simple, yet very beautiful scarf pattern. I made it with 3.75mm needles with 5 repeats of the pattern, and it was about 6" wide. 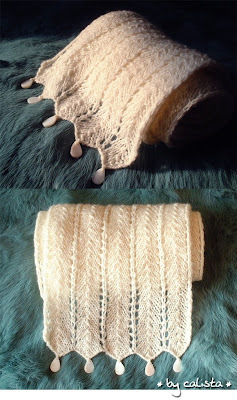 In order to get more lace effect, use larger needles than usually recommended for the yarn size. You can adjust the needle or the yarn size as you want. Rep these two rows until desired length, then Row1 one more time. Block and sew the beads at the pointy parts. Tada~ You have a beautiful lace scarf. This is a beautiful scarf. I think my sister will really like it. I am wondering though... what yarn and how much did you use? Also, what does the *'d line at the end refer to? Anyway, at least for other readers I'm posting this reply. The * marked line was for the explanation of abbreviation, but it might be confusing to read. So, I've edited it to be at the top and marked "abbreviation". :) Thanks!